We all drill, all the time. We take drills and what they do for granted, but reviewing the obvious doesn’t hurt – and there may be a nugget of new information that is brought to light. Drilling is done for decorative purposes, to install components, to allow a saw blade or bur to be accurately inserted through sheet metal, and to situate stone settings. Most metalsmiths drill with a flex-shaft, using standard twist bits. We often use very tiny bits, which can break easily, and the process usually results in flying debris. Eye protection is required at all times when drilling. Making a dent. To ensure that the drill bit does not skip and scar the metal, it is best to have a small sharply defined indentation where you want to drill. You can make the dent with a center punch. An automatic center punch can be useful for locating an exact spot for the dent. A prick punch, which has a long, needlelike taper, works well for denting a precise spot. Lay out the plan on the metal with a sharp scribe and indicate where the dent should be. Then lay the punch down almost flat on the metal with its point exactly on the spot for the dent. Carefully raise it up and tap it with a hammer. By having it flat and raising it up, you achieve very exact placement. It’s also faster than trying to hold a punch vertically and placing it perfectly onto a given spot. A large darning needle works well as a prick punch. I usually snap off the eye of the needle and briefly anneal the very back end of the punch to soften it. This prevents it from shattering accidentally when hit with a hammer, and it keeps it softer than the hammer face to prevent marring. You can also use an awl or point burnisher in a graver handle, as well as a beveled or onglette graver, to create a suitable dent in metal. When using any of these tools, be sure to start the drill slowly to avoid slipping, as the dent is not as smooth as those made with the previously mentioned tools. Moving a hole’s position for accuracy. When drilling into a dent, always make a pilot hole using a much smaller drill bit than the hole you want to drill. The moment the drill begins to cut at the surface, hold it steady and watch, pressing it down only far enough that the cut becomes a full shiny circle, so you can see how accurately the dent was positioned. Don’t drill into the metal, just mark it. Now, you can see if you need to move the dent in one direction or another. 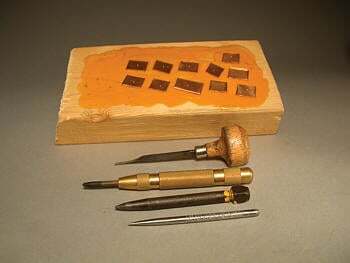 To move a dent, use a beveled or onglette graver. Decide which direction from the hole the dent should move. Point the graver at the hole from that direction. (See diagram above.) Position the tip of the graver 0.5 mm to 1 mm away from the hole, depending on how far you want to move the dent. Drive it in at about 50 degrees, and then lever it up and out. This moves the hole, and the dent, in that direction. Lastly, take the small pilot drill and begin drilling again in the new position. A hole can be moved as far as a few millimeters, which is usually enough. Pilot drilling. Pilot drilling is vital for getting an accurate hole. I will often begin a hole with a 0.6 mm or 1 mm drill bit, regardless of what size the finished hole will be. Once, when I was laying out a series of graduated circular holes in a girder shape, I used 19 drill bits for the central, largest hole to ensure accuracy and proper spacing between the holes. So here’s a good habit to get into when drilling: After making each hole, take a larger drill bit or a ball bur and, by hand, turn it once in the hole. This deburrs it and leaves a tiny but perceptible shiny bevel on the top edge of the hole. This “finish as you go” behavior really cuts down on the total time spent working on a piece, and it keeps construction clean and tidy.